I was literally asking myself, “Am I going to make it?”. I still remember actually praying in the middle of what I felt was one the toughest workouts I’ve ever done. 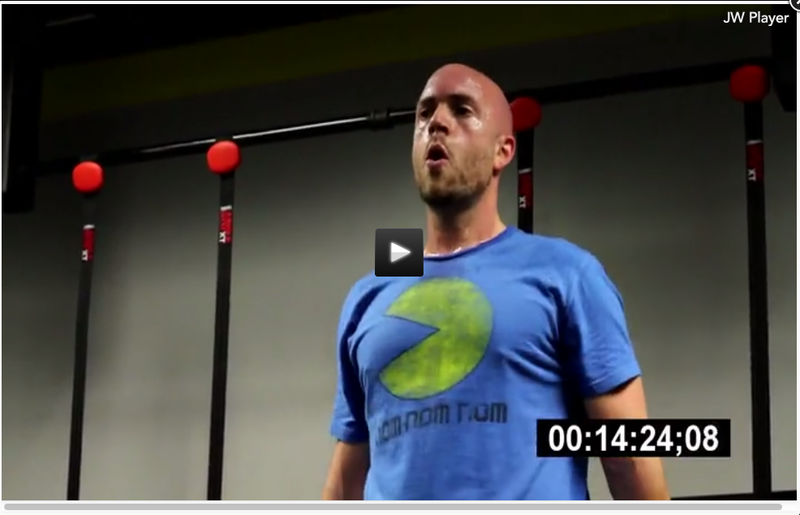 That’s a screen shot of the follow-along video of just one of the 51 workouts from the Home Workout Revolution. The conditioning circuit started with Low Box Jumps (I landed like a Ninja after Craig taught me how to land softer). There’s also a bodyweight version of this exercise in the video. Then it went into the evil Switch Lunge. This simple, yet powerful leg exercise not only works your legs, but puts your heart rate through the roof. You’ll develop a love/hate relationship with these, but don’t worry, I’m right there suffering with you every rep of the way. Then there was what’s called “active recovery” with the Split Shuffle. You’ll enjoy this “easier” exercise as you recover, but still have your heart rate pounding. You’ll probably hear your heart thumping in your ears, but that’s ok. That means you’re working hard… mine is thumping, too. 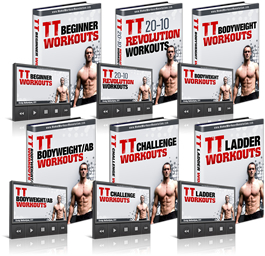 Then it’s time to smoke our abs and work our upper body with the T Pushup. You might get delirious like I did… there’s a blooper where I literally do jazz hands in the middle of a rep.
Next, we’ll hit the Narrow Stance Bodyweight Squat. Sometimes, it’s easy to let your chest fall on this as you get fatigued, so be sure to watch me and listen to Brian Kalakay coach us through it. But this is where we’ll really need Brian… after the NS Squat, we have to knock out some Burpees. There’s 2-3 variations of these and I’ll show you all of them in the video. Then we end the circuit with Jumping Jacks. But unfortunately, this is a density circuit, so we only rest just enough to catch our breath and then we have to keep it going. Give it all you got for just 15 minutes… you can do this. You’ll get BETTER results with these short, intense metabolic workouts that are SHORTER than your commute to the gym. But the best part? Craig Ballantyne, Brian Kalakay and myself are right there with you every step in follow-along videos. Yep, you can download these videos to your Ipod or Ipad, computer, etc. 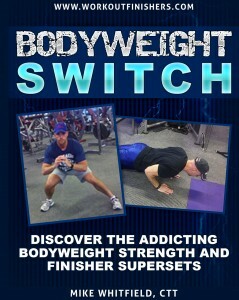 And because you love a challenge, I’m throwing in some strength and finisher supersets with “Bodyweight Switch”. … and you guessed it – ZERO equipment required. But I do have some bad news… the bonus plus the VIP sale expires TODAY. Then forward your receipt to Cole at cranktraininghelp@gmail.com, and she’ll send you the Bodyweight Switch program. Also, let me know your favorite workout!